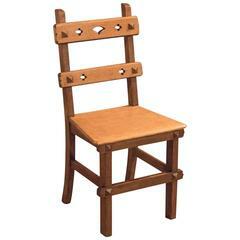 This is an antique Glastonbury chair, English Tudor Revival hall seat dating to the early 20th century, circa 1900. A fine Glastonbury chair faithful to its origins Exhibiting ecclesiastical and gothic overtones Classic tusked joints, the 'keys' of wood were designed to be removed to simply disassemble the chair for transportation In English oak displaying grain interest in a wax polished finish. Shaped armrests synonymous with the style Raised on 'X' frame legs united by a centre point stretcher Raked, plain panel back and seat with a later cushion for comfort. A desirable chair with solid joints and construction, delivered waxed, polished and ready for the home. Dimensions: Max width 66cm (26'') Max depth 51cm (20'') Max height 77cm (30.25'') Seat width 51cm (20'') Seat depth 41cm (16.25'') Seat height 43cm (17''). Antique Louis XV walnut hall chair, circa 1900-1910. Fine 19th century pair of English Regency hall chairs, in mahogany, circa 1815. Art Nouveau hand carved hall chair with a red velour or velvet seat. An early 19th century Gothic Revival hall seat of exceptional color, Irish, circa 1830. A pair of American 19th century Gothic Revival walnut hall chairs. The side chairs are still upholstered in their original leather.